With her best friend slipping away and her parents recently separated, Tatum’s life has turned upside down. Plus her good friend Aaron thinks that they are secretly boyfriend and girlfriend, all because of one little lie Tatum told. Accepting change isn’t easy for Tatum, but just how much is she willing to give up to hold on to her friendship with Lori and life as she knows it? For Tatum, the best way to move forward may require a whole new formula . . .
Yay! I am huge fan of the Classof2k11 and of Amy! She is so darn sweet and totally hilarious. OyMG (2011) was her debut - totally still time to pick it up - and I'm happy there is another book coming! There are so many awesome middle grade books out and I've really been enjoying them. 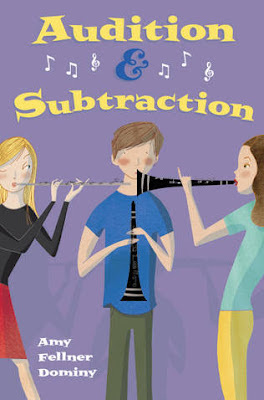 I just know Audition & Subtraction (get the pun?) will be great too! Amy is hosting a contest, but you can enter right here!